Man that is an awful title for what I am about to provide to you. Last night I was in the grocery store, getting some toiletries for Tegan and myself, as well as some cough medicine for Ruth. As I entered the store and passed alongside the checkout lines, I noticed the magazine racks and the TV Guide in particular. You can from the cover why I was so mesmerized. Naturally I bought it. (I mean . . . it's got THE DRIVESHAFT SONG!!!!!!) 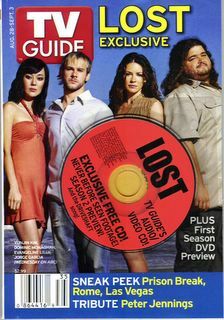 The articles are interesting and the promise of LOST-related interactive media was just too much to pass up. Now for the "Space" part. It is a space probe that is heading to Mercury. Right now it is approximately here. But to get there, it had to leave Earth orbit, obviously. Lucky for us, while doing so its Hi-Res cameras took many images that NASA has pieced together into a very nice little movie. that movie of the Earth receding into the distance captures EXACTLY how i feel about this planet, sometimes. Oh, Messenger, why could I not have come along? i hear Mercury even has mild winters.